When discussing new age music, you can’t help but mention the impact of Grammy Award-winning producer and guitarist Will Ackerman. During his time at Windham Hill Records, Ackerman single-handedly fostered the careers of generations of acoustic guitarists and pianists. The Livermore Valley Performing Arts Center staff is excited for Ackerman to take the stage at the Bankhead Theater this coming Thursday, March 28 for a “Gathering4Guitars.” Ackerman will be joined by kalimbatar/guitarist Trevor Gordon Hall, Imrat guitarist Todd Mosby, and acoustic guitar maestro Vin Downes. 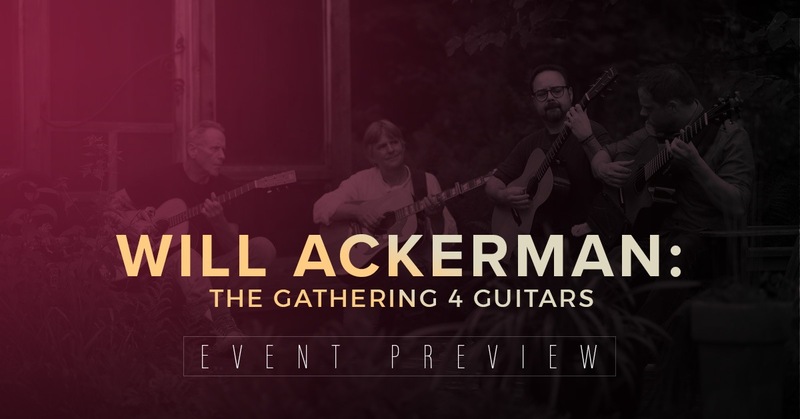 Keep reading to learn more about Ackerman and the rest of these incredible musicians. Ackerman began as a musician and the founder of Windham Hill Records, discovering major talents such as George Winston, Michael Hedges, Liz Story, and Alex de Grassi. He quickly earned a reputation as an exceptional producer. Meanwhile, Windham Hill influenced a generation of contemporary music, emanating from folk roots, acoustic guitar, and a sleek piano sound. Ackerman won the Grammy Award for Best New Age Album in 2004 for “Returning” and is the recipient of more than 27 platinum and gold records internationally. His first “Gathering” CD won the coveted ZMR Album of the Year and Best Contemporary Instrumental Album awards. Ranked in the top thirty guitarists worldwide under the age of 30 by “Acoustic Guitar” magazine, Philadelphia-native Trevor Gordon Hall’s compositions range in style from edgy driving rhythms to soft melodic phrases. He is the world’s only Kalimbatar player, having collaborated with Martin Guitars to redesign an instrument called the kalimba. Greatly influenced by the music of artists on Windham Hill Records in the late 1980s, Vin Downes furthered his interest in finger-style technique and composition by earning a degree in classical guitar performance and music education from William Paterson University. His compositions have been performed by the New Jersey Percussion Ensemble, Helix Ensemble, and members of the Composer’s Guild of New Jersey. Toss Mosby is a two-time Global Music Award recipient and the only guitarist to enter the famed Imdadkhani Gharana of musicians, India’s most respected music family. Mastering multiple musical forms including classical, jazz, and Indian, this broad spectrum of musical knowledge enables the St. Louis native to create works that are both highly creative and intelligent. The aforementioned guitarists will perform separately and together in an evening of music filled with beauty, intrigue, and wonder. Tickets for the single performance start at just $20 and are going quickly, so be sure to get yours as soon as possible. At the Livermore Valley Performing Arts Center, we believe in making the arts affordable and accessible for everyone. That’s why we offer student and military tickets to nearly every performance, including this one. Please contact the LVPAC box office should you need student, military, or ADA tickets. Everyone, including children, must have their own ticket to enter the performance. ADA spaces are reserved for wheelchairs only — no exceptions. Our military discount is offered to veterans and active military personnel. Please be prepared to show your military ID upon arrival. Whether you’ve seen 100 performances at this venue or you’re checking it out for the first time, the Bankhead Theater never disappoints. For more than a decade, this 507-seat venue has brought together a wide range of artists and audiences. From classic rock and smooth jazz to authentic western swing and world music, our performing arts center really does offer something for everyone. We look forward to seeing you at the Bankhead for a “Gathering4Guitars.” Get your tickets today!